Are you under the impression that thermal conductivity doesn’t impact your life very much? In our thermal conductivity perspectives series we are setting out to prove you wrong! Understanding how thermal conductivity affects the objects that we use everyday can help us get the most out of them. A previous post discussed how knowing the difference in the thermal conductivity of different fabrics can help us decide what type of clothing to wear for certain weather conditions and activities. Today’s post will hopefully give you a better understanding of how the thermal conductivity of the utensils that you use in the kitchen affects your cooking, and will help you out the next time you’re shopping for new cooking supplies! The transfer of heat forms the very basis of cooking, therefore it stands to reason that thermal conductivity plays a large role in the process. 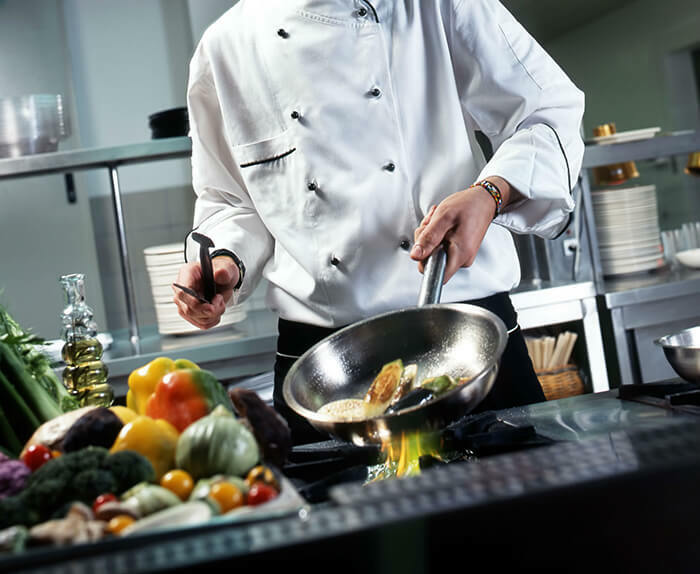 The equipment that you use in the kitchen is responsible for this transfer, and its thermal properties have the potential to make, or break, your cooking. When we think of materials that are used in the kitchen, metals are one of the first ones to come to mind. The majority of pots and pans are composed of metal, as it has a remarkable ability to resist heat. Metals also have high thermal conductivities compared to many other materials, however, the thermal conductivities of metals can vary substantially from one another. Thermal conductivity is the ability of a material to transmit heat, therefore, a metal with a higher thermal conductivity will heat up faster than one with a lower thermal conductivity. This characteristic is sought after for cooking supplies, as a high thermal conductivity means that the heat from the stove will reach the food needing to be cooked more quickly. A high thermal conductivity also translates into a more even temperature across the cooking surface, which helps ensure that all of the food cooks equally. Ending up with food that is burned in the middle of the pan and still raw at the edges is not only irritating, but also wastes time and money! A high thermal conductivity also means that the pan will change temperature more quickly, which means that when you turn the knob on your stove from medium high to medium low, a high thermal conductivity pan will transmit that change in temperature to the food more efficiently than a low thermal conductivity pan. The thermal conductivity of a pot or pan also determines what it can be used for in the kitchen. For example, ceramics are incredibly popular for use in the oven, however, many people have accidently cracked ceramic dishes if they have tried to use them on the stove top. This happens because ceramics have a low thermal conductivity. As heat is transmitted more slowly across the material, a temperature gradient forms between the incredibly hot surface against the burner, and the cooler surface on the opposite side. If this gradient becomes too large, the ceramic cannot handle the stress, and simply cracks. As mentioned above, not all metals are equal when it comes to cooking. In 1994, Gustavsson et al. measured the thermal conductivity of copper, aluminum, and brass using the Hot Disk TPS thermal conductivity system. Take a look at the table below to see the large variation in the thermal conductivity of the metals tested. Based on this table, which metals do you think would make up the best cooking equipment? Copper and aluminum are highly prized for use in the kitchen, however there is one catch. They are both reactive metals when it comes to food, which means they need to be coated with another material to make them safe for everyday use. Have you ever wondered why the more expensive stainless steel cookware often has a copper or aluminum disk embedded in the bottom? This is to give you the high thermal conductivity of that metal, while also providing you with a safe, durable cooking surface. Stainless steel on its own has a much lower thermal conductivity, and therefore will not provide the same efficient heating and even temperature surface. Table 1. Thermal conductivity values of metal samples obtained by Gustavsson et al. (1994) using the Hot Disk TPS thermal conductivity system. Thermtest is excited to have added a thermal simulation program to our website, which is free to download and can be used to illustrate how heat moves through different materials. Below are three images from a simulation created to illustrate how pans made of each of the metals in the table above would react to the same level of heat on a stove. Figure 3 is the start of the simulation, all of the pans are at room temperature and have just been placed on a burner at 100°C. Figure 4 was captured at a few seconds into the run, and clearly shows how the pan made of copper has reached a higher, more even temperature than the other two metals. Figure 5 illustrates how copper maintains a higher temperature than the other two metals, and how that translates into the chicken reaching a higher temperature than it has in the other two pans. Figure 3. The beginning of a heat simulation using pans of copper, brass, and aluminum. Figure 4. Illustration of the temperature of three pans several seconds into a thermal simulation. Copper has heated more quickly than aluminum and brass. Figure 5. Several seconds into the simulation copper is maintaining a higher temperature and heating the chicken more evenly than the other two metals. Hopefully this article has given you a better understanding of the important role that thermal conductivity plays in cooking. Using pots and pans containing a high thermal conductivity metal can make a huge difference in the quality and ease of you cooking. Next time you look for new kitchen supplies, you will know what characteristics to look for! To read more on the metals research performed by Gustavsson et al. (1994), please click here. Gustavsson, M., Karawacki, E., Gustafsson, S.E. 1994. Thermal conductivity, thermal diffusivity, and specific heat of thin samples from transient measurements with hot disk sensors. Review of Scientific Instruments. 65(12): 3856.